Making dinner is sometimes such a hassle or very time consuming! Check out these yummy and quick recipes that will have any family satisfied and happy! 1. 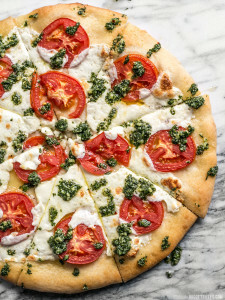 White Pizza with Parsley Pesto Take your margarita pizza up a notch with some pesto. Stir together 1 Tbsp olive oil and the garlic powder. To make the parsley pesto, finely mince 1 packed cup of fresh parsley leaves (about 1/2 cup once minced). Add the minced garlic, grated Parmesan, salt, pepper, and red pepper flakes. Add the lemon juice and olive oil to the mixture, starting with just 1 Tbsp lemon juice and 2 Tbsp olive oil, and adding more if needed to create a mixture that is loose enough to drizzle over the pizza. Begin preheating the oven to 500ºF. Thinly slice the tomatoes and fresh mozzarella. Stretch or roll your pizza dough out to a 14-16″ disc. Place it on a pizza pan or baking sheet. Stir the garlic and oil, then brush a thin later over the entire surface of the dough, including the outer crust. Arrange the tomato slices evenly over the pizza dough, then top with torn slices of mozzarella. Bake the pizza in the fully preheated 500ºF oven for 10 minutes, or just until the outer crust is golden brown and the cheese is melted, but not browned. After removing the pizza from the oven, drizzle the parsley pesto over top, slice into eight pieces, and serve! 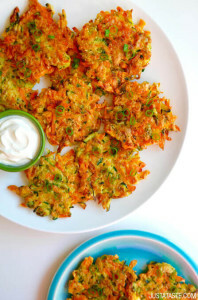 For a healthier option than fried chicken or crispy hash browns, try these vegetable fritters that have the texture and crunch of a guilt food but not the calories! Place the shredded zucchini in a colander and sprinkle it lightly with salt. Let the zucchini sit for 10 minutes then using your hands, squeeze out as much liquid as possible. Transfer the zucchini to a large bowl then add the carrots, garlic, flour, eggs, scallions, 1/4 teaspoon salt and 1/8 teaspoon pepper. Stir the mixture until it is combined. Line a plate with paper towels. Place a large sauté pan over medium-high heat and add the olive oil. Once the oil is shimmering, scoop 3-tablespoon mounds of the vegetable mixture into the pan, flattening the mounds slightly and spacing them at least 1 inch apart. Cook the fritters for 2 to 3 minutes then flip them once and continue cooking them an additional 1 to 2 minutes until they’re golden brown and crispy. Transfer the fritters to the paper towel-lined plate, season them with salt and repeat the cooking process with the remaining mixture. Serve the fritters immediately topped with sour cream or yogurt. 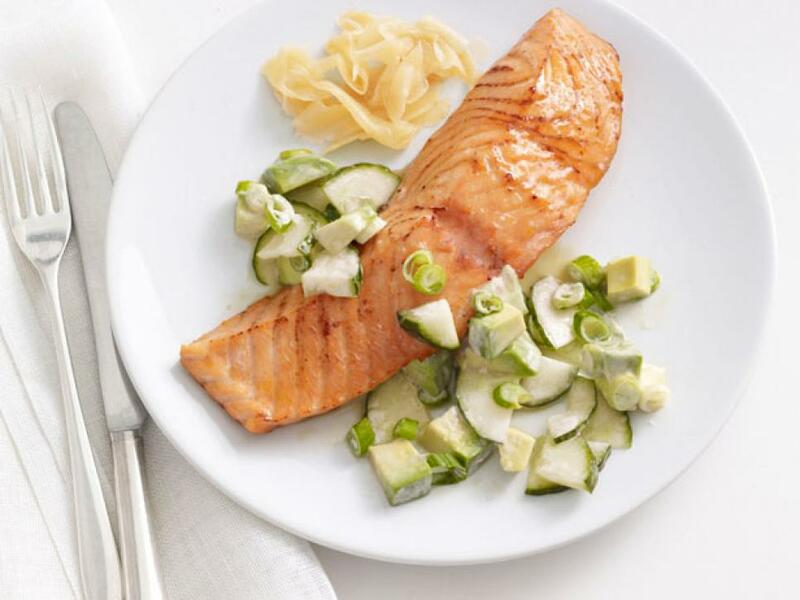 For a fresh and healthy choice, try this minimalistic recipe perfect for any seafood lover. Preheat the oven to 400 degrees F. Mix the honey, 2 teaspoons soy sauce and the cornstarch in a small microwave-safe bowl. Microwave until just simmering, 30 to 40 seconds. Rub the fish fillets all over with 1/2 teaspoon sesame oil and season lightly with salt. Place the fish in a baking dish and bake 5 minutes. Remove from the oven and brush with the honey-soy sauce mixture. Return the fish to the oven and continue baking until just cooked through, 7 to 9 more minutes. Meanwhile, whisk the rice vinegar, mayonnaise and the remaining 1/2 teaspoon each soy sauce and sesame oil in a large bowl. Add the cucumber, scallions and 1/4 teaspoon salt and toss. Gently fold in the avocado. Serve the salmon with the salad and pickled ginger. Share the post "Cheap and Simple Dinner Recipes"